One of the reasons I've been playing around so much with sweet potatoes lately is because Saturday night we are going to the Cookin' Minnesota "No Flu For You" Dinner. We were given a list of ingredients that are said to have properties that help you stay healthy during the flu season & were asked to make something using one or more of the ingredients. I am doing a dessert & thought sweet potato seemed like the perfect ingredient (leafy greens not so much). I'm not exactly sure where I got the idea to layer my Sweet Potato Butter in baklava but I thought it would pair really well with nuts & honey (& bonus points, honey is another No Flu ingredient!). I've never made baklava before so I looked around on the web & found this recipe on Allrecipes which seemed like a good starting point. I still ran into some questions about the actual layering which Joy of Cooking was able to answer (seriously I think I rarely run into a cooking question that Joy can't answer). This baklava turned out really well & I think looks fabulous. I was right about how the sweet potato would taste with the other ingredients. I actually liked this version better than most I've ever had in restaurants, that added component just seems so right. Making baklava was easier than I thought too with the most tedious part being shelling the pistachios. This seems to be the winning choice to take on Saturday. Preheat the oven to 350 F. Butter the bottom & sides of a 8" x 6" glass baking pan. Mix the chopped nuts & cinnamon together. Cut the phyllo sheets to fit your baking pan. Keep them covered with a damp cloth while you are working so they don't dry out. Lay two sheets on the bottom of your pan & brush them generously with butter. Repeat this 3 more times (you will have used 8 sheets of phyllo). Spread the Sweet Potato Butter over the phyllo creating a thin even coat. Lay two more sheets of phyllo on top of the sweet potato & butter them. Sprinkle about 2 tablespoons of the nuts on top. Repeat the phyllo, butter & nut layer two more times (you will have used 14 sheets of phyllo). Place two more sheets of phyllo on top of the last layer of nuts & generously brush with butter, repeat this layer 3 more times (you will have used all 22 sheets of phyllo). Use a sharp knife to cut the baklava into squares, make sure to cut through to the bottom. Bake for 45 - 50 minutes or until crispy & golden. 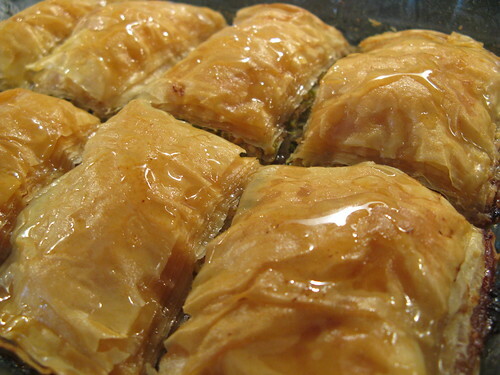 When baking the baklava, bring the water & sugar to boil in a small pan. Boil & stir until the sugar is melted. Reduce the heat to low & add the honey & vanilla. Allow to simmer for 20 minutes until it is thickened. Remove from heat. Spoon this sauce over the baklava right after you take it from the oven. Allow the baklava to cool completely before serving. Hi Sweet Potato (I told you that would be your nickname for the week!). I hate working w/ fillo dough, what a pain. Better you, than me! Peter M. from Kalofagas blog will be proud of you! (Greek food blog). You area genius! I am so impressed with this idea. I have never made baklava either, but I can see that the sweet potato is a perfect ingredient! I love desserts where you can say, I can have this because it is healthy... Such great excuses! I so need to make this. Your sweet potato butter is a super star Kat. I love these ideas. Keep 'em coming. What a creative way to use the sweet potato butter! Fantastically inspired! Now this is a pleasant surprise to come thru my reader! Although sweet potato is not a traditional baklava ingredient...it would and has worked here. You handled the phyllo well and I don't see why people have issue/struggle with it. My only criticism is that you did not include cloves...integral for the flavour and aroma of baklava. oh kat. baklava is one of my top five favorite desserts (currently #2, but that's subject to change daily), and this is phenomenal. it looks absolutely perfect, and i imagine that tasting it would be akin to frolicking in heaven. nicely done! What a great way to think outside the box. 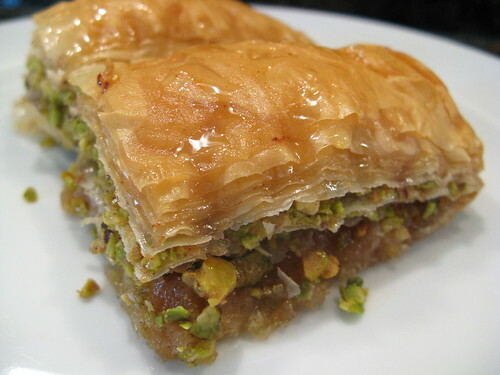 You got to make baklava, do it with a twist, eat dessert and avoid the flu - can it get any better than that? I love this! What a great addition to a classic dessert. This sounds great! I am going to have to try this.